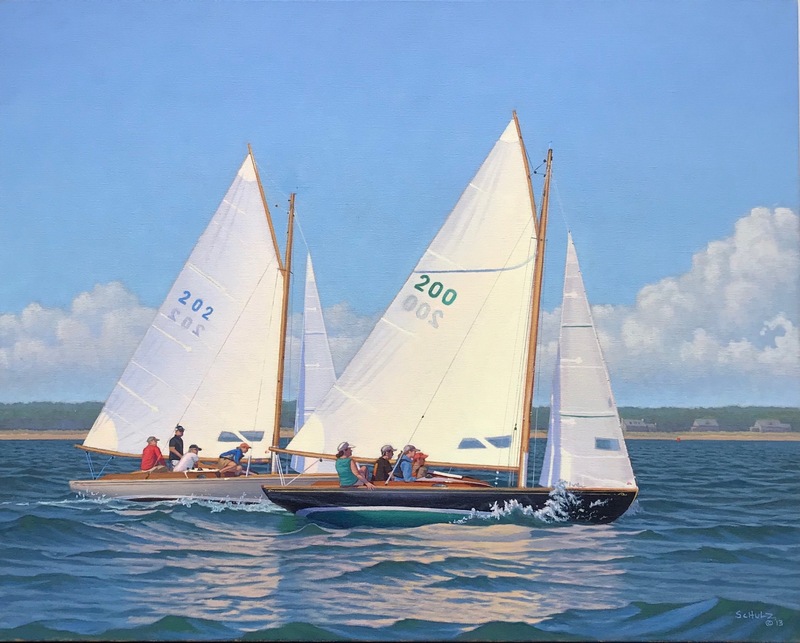 While I don't really consider myself to be a Nautical Artist or Maritime Painter, I think my work is more aptly described as Coastal Paintings. However, I have a personal affinity for the beautiful lines and historic nature of the Crosby Wianno Senior and their colorful, ecentric, competitors. George Largay, who is featured in the painting above in his classic red jacket, once remarked to me, "Matthew, why do you always have me in second place?" To which I responded, "Mr. Largay, you're a Man on the move, there's no drama in First Place." 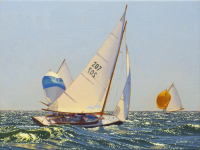 The work generally reflects the smaller bodies of water like Nantucket Sound, Barnstable Harbor or the Five Bays sorrounding Osterville, Hyannisport featuring Wianno Seniors, Havens and Crosby Fast Cats. 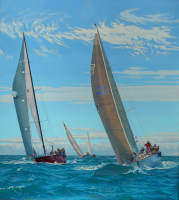 Although the Figawi paintings have been the exception. 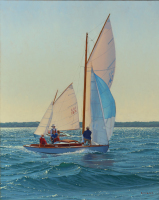 Since Wiannio Senior and Nautical paintings take about twice as long as a Landscape to create, so you may consider commissioning a racing painting of your Senior?